Do you open a lot of windows on your Mac? Do you ever have trouble keeping track of them all? Then you need to know about Mission Control, which shows you all of your currently open windows, then gives you ways to organize them. Mission Control is one of those Mac features that’s easy to ignore but makes everything better once you learn about it, mostly because of the multiple desktops feature. Master using those, and the quick ways to switch between them, and you’ll wonder how you ever used your Mac any other way. You can access multiple desktops in a number of ways. To access it, swipe up with three or four fingers on your trackpad—the number of fingers you need to use depends on how you have your trackpad set up. You can also just tap the F3 button on your Mac, the Mission Control icon in the dock, or by pressing Control+Up on your keyboard. The Touch Bar on new MacBook Pros doesn’t have such a button on the Control Strip, but you can add a button if you like. Once you open Mission Control, it will show you all your open windows, so it’s easier to switch between them. 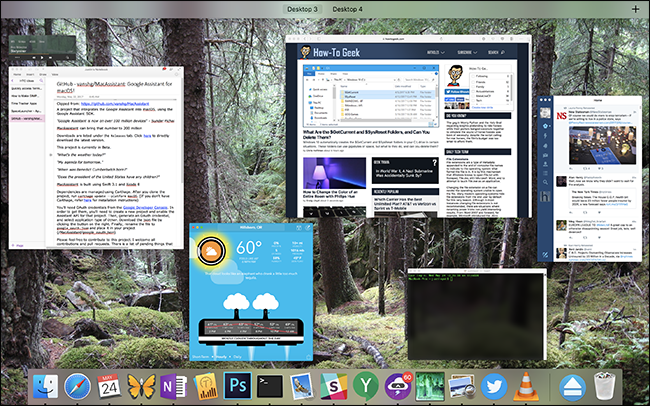 This is similar to a feature called Exposé featured in older versions of macOS, but today we’re interested in the multiple desktops feature along the top. Move your mouse to the top of the screen, where it says “Desktop 1” and “Desktop 2”, and you’ll see two desktops revealed. You can actually drag windows to one of these desktops, if you want, then switch to the window by clicking it. With multiple desktops you can organize your workflow, allowing you to do things like research on one desktop while you write on another. And you can add as many desktops as you like by clicking the “+” button at far right. To switch between desktops, you could just open Mission Control then click the desktop you want to open. It’s a lot faster, however, to use the keyboard shortcuts Control+Right and Control+Left, or to swipe three fingers to the left or the right. These will both switch your desktops immediately, and are a nice compliment to the keyboard and mouse shortcuts I mentioned earlier. If you want a particular application to always show up on a certain desktop, or even on all desktops, simply right-click its dock icon, then move to the Options submenu. From here you can assign an application to a given desktop, or even have it show up on all desktops. But wait…there’s more. Do you know about the full screen button? It’s the green one near the top-left of every window. Click this button and the current application will enter full screen mode, meaning the dock and menu bar disappear and the current window takes up the entire screen. You might think that you can’t use any other programs while full screen mode is active, or that you can’t use two programs in full screen at once, but it turns out Mission Control makes this all possible. 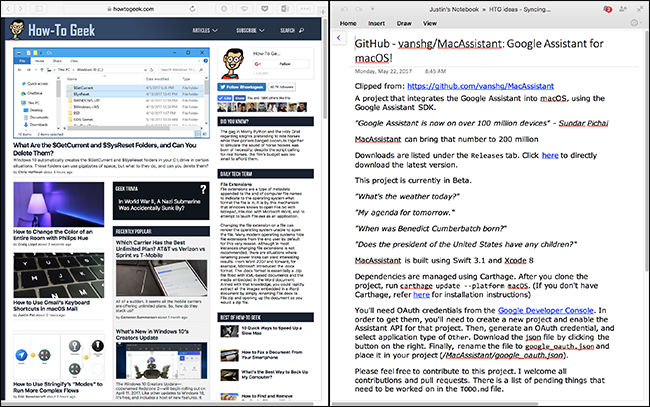 While you’re in Mission Control, any full screen application acts as its own desktop; it’s placed to the right of all current desktops. You can also drag any window to the space taken by a full screen application. This allows you to run two full screen applications side by side, in what’s called split view mode. This is perfect when you want as much space as possible to work with only two applications, such as when you’re browsing a high-quality website and taking notes. Mission Control mostly works without any configuration, but it’s possible that a few things about it annoy you. Head to System Preferences, then the Mission Control section. By default Mission Control will organize your spaces automatically, based on what it thinks you want. This can be very confusing, so turn off the “Automatically rearrange Spaces based on most recent use” option if you’re constantly losing track of windows. When you use Command+Tab to switch applications, you probably also want to switch to an active window. The option “When switching to an application, switch to a Space with open windows for the application” ensures that will happen even if the window is on another desktop. The option “Group windows by application,” when checked, ensures that multiple windows from the same application appear side-by-side in Mission Control. The option “Displays have separate Spaces” applies to Macs with multiple monitors. By default switching desktops on one display will also switch the other, but with this option checked each display will have it own set of desktops. Finally, you can turn on the useless Dashboard, either as its own Space or as an overlay. 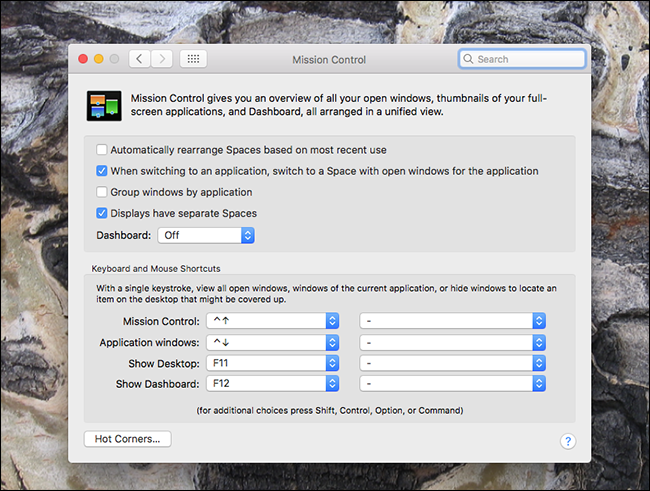 Below these options you can set custom keyboard and mouse shortcuts for launching Mission Control.